Davinia Rodríguez, a soprano from Spain’s Canary Islands, made her Seattle Opera debut last season as Lucia in the alternate cast for Lucia di Lammermoor (a production that featured our current Orphée, William Burden, as Edgardo in the opening night cast). Now she returns to the company for her role debut as Eurydice in Orphée et Eurydice, and we ask Davinia what this myth is like from her character’s perspective, and how this opera differs from what she's used to singing. Since you were here in Lucia di Lammermoor, we hear there’s been a new addition to your family. A daughter! She’s five months old and is my love. Do you sing to her? Does she like opera? Of course, I sing to her all the time. During my pregnancy, I was singing every other day and, actually, the day she was born I had an appointment with a pianist because I was getting ready to go to Japan for two concerts and a recital. So it was impossible to keep that appointment because my baby was here. But after a week, I was singing again. My daughter gets smiley when I sing—but also sleepy, it’s crazy. I’m studying for Traviata, for example, and she sleeps right through it, and I’m singing full voice! But, well, I guess I’m lucky. There’s a lot of dance in Orphée et Eurydice. How much of that choreography do you take part in? Only a little bit. We began in rehearsals doing more than I have ended up doing in performance, but I do have to think about how to move in Eurydice’s world. For example, walking. As Eurydice, I walk naturally, of course, but it’s not like how I walk when I go to the supermarket or in everyday life. It has a different energy. 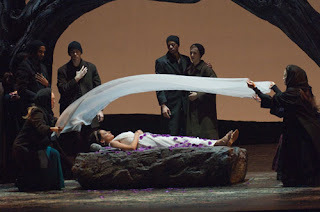 Eurydice (Davinia Rodríguez) dying in the arms of her beloved Orphée (William Burden). We’re doing this opera with a tenor Orphée, although sometimes other voice types play the character, as well. What do you think it brings to the opera to have a tenor in the role? Well, it’s my first time doing this opera, and this kind of opera. But I imagine that if you perform with a mezzo-soprano, for example, the feeling has to be the same. Because, well, when you are playing your role, you have to believe in what you’re doing, and you have to see Orphée in whatever partner you have. I’m happy it’s Bill because I love him. As a person, he is amazing. As an artist, the same. Wow, every time he opens his mouth, it’s amazing. Also, he’s very funny, so working with him means a lot of smiling and fun times. What else can I ask for? I’m like, thank you! You mentioned this is your first foray into 18th century opera. How has it been different from what you’re used to singing? For me, I usually sing bel canto and verismo, but this hasn’t been too different because I’m always trying to do what is written in the score. Also, this is my first time working with Gary Thor Wedow, and I’m in love. Ah! Wow, he is really good. I have to say, I’m very happy. His mind is open to us, open to accept our art. We’re always working together to find some color and play a little bit with what is written. 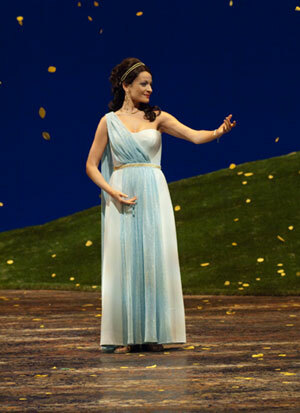 Davinia Rodríguez (Eurydice) in Seattle Opera's current production of Orphée et Eurydice. When I talked to William Burden, he said it was interesting to look at the story of Orphée et Eurydice from Eurydice’s perspective. What is she thinking throughout this experience? When I’m in Elysian Fields, I don’t know why I’m there. But I’m in a world I love because there is peace and happiness, and I don’t even remember Orphée. And when I look at him—and he doesn’t look at me—I say, “Is it you? What are you doing here?” All our history starts coming back, but I don’t understand what is happening, why he doesn’t touch me, and why he doesn’t look at me like he had before. I don’t understand any of it. And then I start to think there’s something wrong with him, and I want to get close to him to find out. I have to know. Why do you think the gods tell Orphée not to look at Eurydice? With mythology, you can ask why and never get a response. But I think it’s so we can understand that not everything you want is possible, or at least not possible to have easily. You have to fight for the things you love or want deeply. Friends mourn Eurydice (Davinia Rodríguez) at her funeral. And, in this version of the myth, you two get your happy ending. I prefer the happy ending because I get to go come back to life. [Laughs] But there’s a lot to go through before that. Like at the funeral in the beginning. Oh my god. It’s really…I just don’t know how to explain it. It’s so emotional, and makes me feel really sad. It’s tragic to play, and I have to concentrate so that I don’t cry. Because it feels real. Director Jose Maria Condemi finds the verismo, and it’s touching all the time. There’s so much pain, it should at least have a happy ending!